For years, the silver bullet coastal barrier option has centered around the coastal spine – commonly known as the Ike Dike – and what could be one of the costliest public infrastructure projects in U.S. history. Recent articles in the Houston Chronicle and the Galveston Daily News outline the lauded benefits and challenges of these “grey” infrastructure projects, but little attention has been given to the alternative solutions that integrate the need for our protection with nature’s own barrier systems. Those of us living on or near the coast know that great rewards sometimes come with its own risk. Living along the Gulf of Mexico provides immediate access to the beauty and bounty that our coastal waters, Bayfront and barrier islands provide. However, living within floodplains, wetlands and storm surge zones pose significant challenges, making each of us vulnerable to the impacts of water and wind. Despite these challenges, there are ways we can live in harmony with what mother nature has provided and our own built environment. This balanced approach does not necessarily require an engineered solution – but the willingness to be creative and implement multiple methods that protect our communities and the ecosystem we rely on. By working with – rather than against – nature, we can keep people out of harm’s way and sustain our coastal communities into the future. Twelve organizations from the Greater Houston-Galveston region have come together to recommend guiding principles for the protection of people and property from flooding and storm surge. 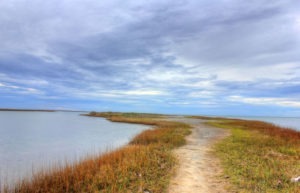 This three-tiered strategy for a Sage Alternative includes: Public, Private and Corporate Responsibility; Preservation and Restoration of our Coastal Lands and Barrier Islands; and, the Minimization of Hard Infrastructure – particularly, dams, dikes and raised roadways. To date, we have only seen our decision-makers seriously consider alternatives with a heavy emphasis on new construction. These proposals pose not only a significant risk to the ecosystem of the Island, but also our pocketbooks as each of these carry a heavy price tag that taxpayers will bear the brunt of maintaining. If past is prologue – the preservation of natural resources has historically and consistently proven to protect our economic and social values. We are no longer in the era of unprecedented storms – we need to be prepared. Engineered alternatives, like the Ike Dike, are costly and come with significant risk. Working with, and reinforcing, natural systems provide a cost-effective, feasible alternative that will protect people from the effects of storm surge, but also safeguard those natural areas we love around Galveston Bay. Supporting organizations to the Guiding Principles include: Artist Boat, Bayou City Waterkeeper, Christmas Bay Foundation, Defenders of Wildlife, Galveston Bay Foundation, Galveston Island Nature Tourism Council, Gulf Restoration Network, Lower Brazos Riverwatch, Turtle Island Restoration Network, Sierra Club – Houston, Sierra Club – Loan Star Chapter, and Surfrider Galveston. To read more about the Guiding Principles for Sage Alternative, please visit http://www.bayoucitywaterkeeper.org/guiding-principles.